Kitchen Window: Home Is Where You Hang Your Apron Whether it's across town or across the ocean, moving is unsettling. But re-creating a meaningful meal — one that connects us to childhood, traditions or travels — can make us feel at home anywhere. 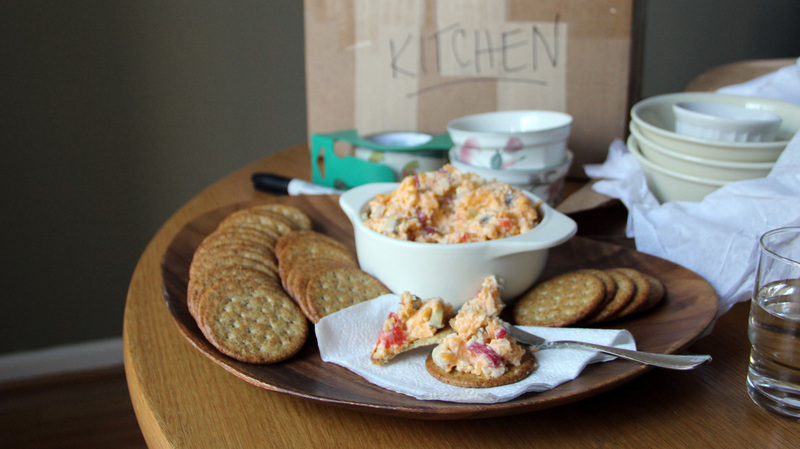 A cheese-and-cracker snack is sustenance during the hard work of packing up the kitchen. And after you've moved, a meaningful meal can help make your new place feel like home. Get recipes for Wright Bryan's Pimento Cheese Spread, Nicole Spiridakis' Baked Tofu With Peanut Sauce, Susan Russo's Quinoa, Chicken And Arugula Salad, and T. Susan Chang's Overnight Baked French Toast. For almost 10 years, Kitchen Window has been providing a weekly peek into the kitchens of writers, chefs and food fans from all over. I've helped produce this series for half of its life, led by its editor and Weekend Edition commentator Bonny Wolf. Today, we're shutting the window — at least a little. As the saying goes, you'll find other windows opening where one is closing (or something like that), and, indeed, NPR's food coverage continues both on-air and online. Much of it finds a home on our blog, The Salt. But we'll no longer publish new Kitchen Window stories here weekly. I'll miss working in this virtual kitchen, but I'm undergoing a big change in my actual kitchen, too: I'm moving to a new house in the next month. And all this change has me thinking about a theme I've noticed in the stories we've shared through Kitchen Window: the idea that food is a powerful thread in our ties to home. As part of an Army family, I've moved every few years my whole life, so I don't usually get attached to a house. It's just a temporary vessel, right? But I will miss the house my husband and I are moving out of now — especially the kitchen. It's the biggest room and the busiest. We've spent ever more time there since buying a comfy old dining set from a Danish fellow in preparation for our growing family. It's a place of discovery for our now 11-month-old Ellinor, as she paws at the morsels we place on the honey-colored tabletop. And it's a place of wonder for us, as we watch her. More than any other place I've ever lived, this house has the kitchen at its heart — and my heart in it! I didn't know I'd grown attached until we were signing the sale contract a couple of months ago, sitting around that very table. It dawned on me, and my eyes widened: I'm going to miss this place. As I think back on all the meals we've shared in this kitchen, it strikes me how often they were inspired by the Kitchen Window stories I was working on. I'd be at the grocery store wondering what to make for dinner or a special occasion, and I'd recall a recipe that had sounded sooo good. I'd find it online on my phone, buy the ingredients and then go home and try it. I'm sharing some of those recipes today. And the whole archive of stories, of course, will always be available online. Now that I'm packing for my own move, I'm reminded of one I helped with a few years back. My friend Krista was moving overseas, and I couldn't believe how much stuff she was planning to take with her — including several large cookbooks. I kept trying to cull her belongings. "You're moving to Spain," I reasoned. "Imagine the foods you'll eat! Are you really going to need these American recipes?" But as she prepared to uproot herself, she felt that she did need them. And I've come to realize why: Because the meals that are meaningful — ones that connect us to our childhoods, our traditions, our travels — we take with us wherever we go. So that wherever we re-create them, that's "home." For anyone, anywhere. It's where you hang your heart — and your apron. Amy Morgan is an editor for Digital News at NPR. My "rustic" version (no food processor) needed an extra heaping tablespoon of mayonnaise, and I let the flavors meld overnight before serving. The recipe yielded about 4 cups. 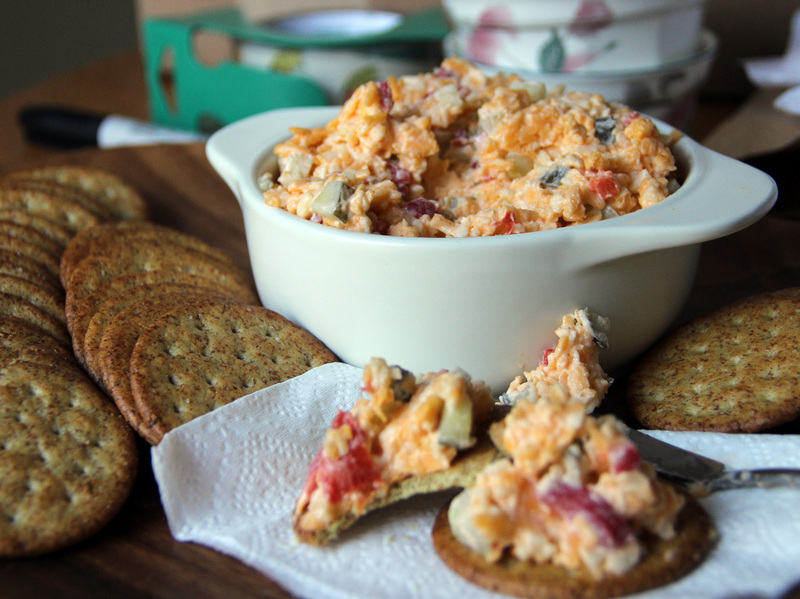 My colleague Wright and I both lived in Augusta, Ga., and share an affinity for Southern food — and high standards for pimento cheese. His family recipe does it right (as opposed to the neon store-bought stuff). I used a lot of garlic when I made this for a Southern-themed book club meeting, and it was a big hit next to the fried chicken. I like it best on sturdy wheat crackers. Cut all ingredients except the pimentos into large chunks. (The pimentos are already chopped.) Place all ingredients in a food processor and pulse just long enough to roughly chop. You don't want to puree the ingredients, just make them pliable for the next step. When she wrote for Kitchen Window about peanut butter, Nicole was living on the West Coast, which I called home for years. So her fresh, simple, often vegetarian or vegan approach resonated. This recipe is so delicious, even my tofu-eschewing husband eats it. The satay-like sauce also goes great with chicken, which I sometimes serve alongside the tofu. Nicole recently moved to Morocco and is now blogging from there. In a medium-size bowl, whisk together the peanut butter, soy sauce, lemon juice, sesame oil, salt and water. Lightly oil an ovenproof baking dish and arrange the tofu so that the slices lie flat. Brush on the marinade with a pastry brush, and let it soak in for about 15 minutes. Place the dish in the oven and bake for 30 minutes, until the marinade is caramelized and the tofu is cooked through. I like to serve this on a bed of spinach (wilted in a sautee pan or in the microwave, with a pinch of salt and a splash of lemon or lime juice). Arugula is something I didn't eat a lot of until I visited Australia, where I saw it (aka "rocket") on menus everywhere. Now it's my green of choice, and not just because it reminds me of our travels Down Under. Susan's arugula pizza recipe is a near facsimile of a pie I had in Sydney. But it's this salad that's become a make-ahead, pack-lunch staple in my house (it lasts in the fridge for several days without getting wilty). To make the dressing, whisk all ingredients in a small bowl and set aside. Add quinoa and water to a medium pot, and bring to a boil for 2 minutes. Lower heat to a simmer and cook, partially covered, for 13 to 15 minutes, or until the water is absorbed. Cover and let sit for 5 minutes, then fluff with a fork. In a large saute pan over medium-high heat, warm olive oil. Add chicken and cook 8 to 10 minutes, or until lightly browned all over. Remove from heat. 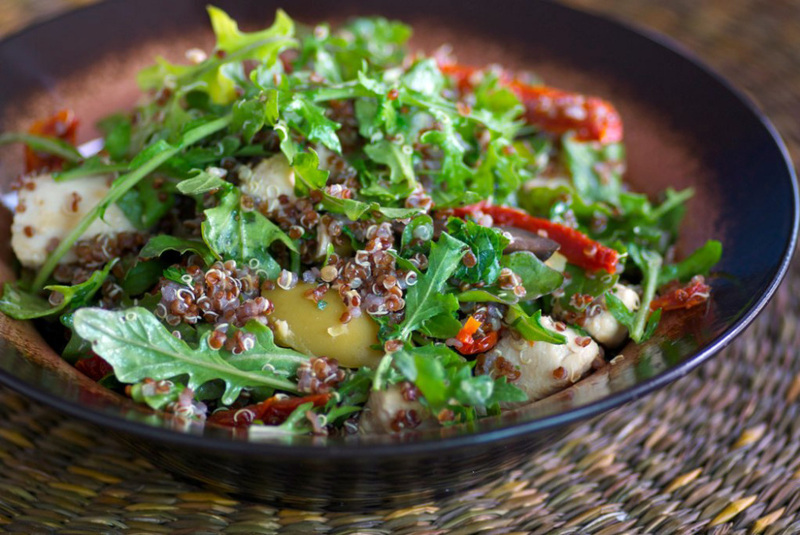 In a large bowl, combine quinoa, chicken, olives, sun-dried tomatoes, nuts and arugula and toss. Pour dressing over salad and toss until well coated. Serve at room temperature. 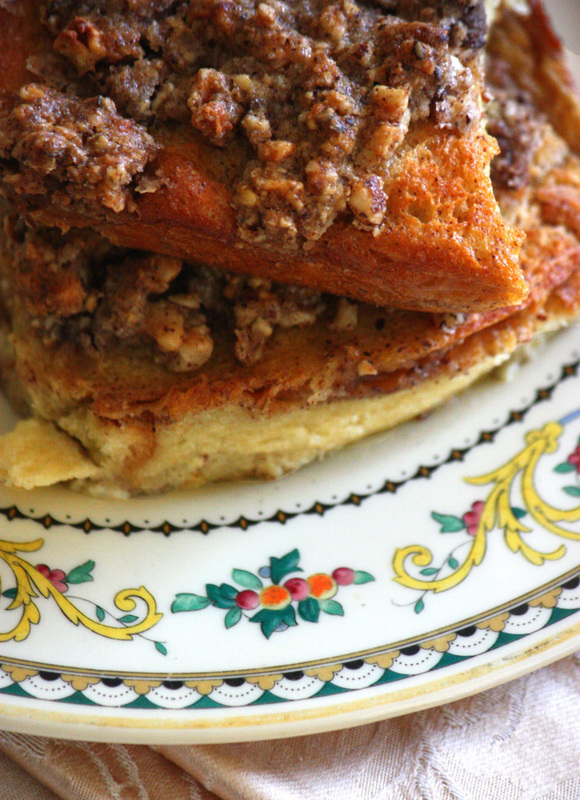 This is no ordinary French toast; it's a knock-your-socks-off, love-in-a-casserole-dish treat. And it's so easy! It reminds me of my mom and dad, as well as close friends in town and old friends from afar — all of whom I've made it for. You don't have to use challah; I was puzzling over what to do with leftover hamburger buns when I remembered this recipe months after Susie wrote about it. Use any kind of bread and any kind of nuts — it's like magic, I swear. Set the slices of bread snugly in a 9-by-13-inch glass baking dish. Beat or blend together the eggs, milk, brown sugar, vanilla, cinnamon and salt. Pour the liquid mixture over the bread and let it soak for about 15 minutes. Then flip the bread over so the other side can soak. Press a sheet of wax paper right against the damp bread and slide the whole thing into the fridge. For the topping, in a food processor pulse the hazelnuts and sugar until the hazelnuts are little bigger than rice grains. Add the butter and cream and pulse until you have a gritty, cohesive mixture. Scrape this mixture into a bowl, cover with plastic wrap, and store in the fridge. Preheat the oven to 350 degrees. Take the soaked French toast out of the fridge and discard the wax paper. Strew the topping all over it and bake in the oven for 40 to 45 minutes. When the liquid has been completely absorbed and the bread is puffed and golden, it's done. Serve immediately with as much maple syrup as you like.